The most common cancers in this area would be skin cancers (basal cell or squamous cell carcinoma) on the surface of the nose. These cancers are discussed here and here. Uncommon cancers in the roof of the pharynx are called nasopharynx cancer and are discussed here. Cancers in the sinuses in the face (nasosinus) including the maxilla and ethmoid sinus are discussed here. There are other uncommon cancers in this area such as Olfactory neuroblastoma (esthesioneuroblastoma) and is discussed here. Cancers of the nasal vestibule and nasal cavity are rare and account for less than 1 percent of all tumors of the head and neck. The nasal vestibule and nasal cavity are separated anatomically by the limen nasi; cancers originating from these sites have different clinical behavior and should be considered separately for the purposes of diagnosis and treatment. NASAL VESTIBULE — The nasal vestibule is lined with squamous epithelium. As such, tumors arising there are most often squamous cell carcinomas (SCCA) and have a natural history similar to that of squamous cell skin cancer. Primary tumors of the nasal vestibule are usually relatively limited at presentation and exhibit a more favorable prognosis than tumors of the nasal cavity. Overview — The nasal vestibule is a pear-shaped cavity which functions as the entrance to the nasal cavity. Its borders are the nasal septum and columella medially, the lower lateral (alar) cartilage laterally, and the pre-maxilla inferiorly. The vestibule terminates posteriorly at the limen nasi, the junction of the lower and upper lateral cartilages, as well as the transition from skin to mucosa. The vestibule is lined by skin bearing hair follicles, sebaceous glands, and sweat glands. Early tumors present as superficial ulcerations or masses of the membranous septum or columella with crusting, scabbing, and occasional minor bleeding. More advanced lesions can perforate the septum or invade the alar cartilage and grow through the skin surface. There can also be extention inferiorly into the gingivo-labial sulcus and premaxillary soft tissues. Growth into the posterior nasal cavity occurs late or with recurrences. Treatment — The goal of therapy is to achieve the best oncologic outcome with the least morbidity in terms of cosmesis and nasal function. For small T1 lesions, either surgical excision or definitive radiation therapy (RT) can be used. Large T1, T2, T3, and small T4 tumors are best treated with definitive RT, as surgical excision of these lesions usually produces significant cosmetic deformity. Extensive T4 tumors, however, require a combined modality approach consisting of both surgery and radiation therapy. Because of the rare occurrence of nasal vestibule tumors, there are no prospective data to guide treatment recommendations; the majority of the literature is single-institution case series. Early stage — T1 and T2 tumors are treated with definitive RT, with a five-year local control rate of 95 percent for T1 and T2 tumors and for all tumor stages a five-year cause-specific survival and overall survival of 90 and 76 percent, respectively. Surgery is a reasonable alternative if the lesion can be removed with a good functional and cosmetic result. Definitive RT usually involves external beam RT (EBRT) followed by a boost, delivered via EBRT or interstitial brachytherapy one to two weeks after completing EBRT. EBRT can be delivered either with opposed lateral fields using megavoltage photons or a single anterior portal using a 4:1 mix of high-energy electrons and megavoltage photons. For both techniques, a tissue-equivalent wax bolus is placed over the entire nose to convert the irregular nasal surface to a box-like contour to improve the dose distribution. The dose delivered by the initial EBRT fields is usually 50 gray (Gy) given in once-daily 2 Gy fractions. This is followed by a boost to the tumor of 20 to 25 Gy. Serious complications with definitive RT are uncommon. Surgical resection of early stage lesions in the nasal vestibule results in local control rates of 90 to 100 percent. Surgery can be a simple wide local excision with or without skin grafting, but can also involve the removal of cartilage (usually either columella or alar cartilage) and/or external nasal skin. It is important that the surgeon assess the likelihood of achieving a complete resection; a lesion that is likely to result in close or positive margins with surgery would be better treated with definitive RT. The surgeon should also critically assess the tumor extent to understand which structures will need to be resected before embarking on the procedure. Nasal floor or lateral nasal wall tumors can be easily removed if there is not deep invasion into the nasal cartilages. Septal lesions can be removed with excellent cosmesis as long as the anterior septal support is not compromised. If needed, the external nose can be reconstructed but often requires multiple procedures by a nasal reconstructive surgeon and may be disfiguring. Advanced stage — T3 and small T4 tumors with no bone invasion are usually treated with RT alone, with surgery reserved for radiation failure. RT is delivered as described above, with EBRT to about 50 Gy followed by an interstitial brachytherapy or EBRT boost for an additional 25 Gy. Extensive T4 tumors should be treated with a combination of surgery and RT, as these tumors have a low rate of local control with either modality alone . In this case, when the treatment consists of both surgery and RT, RT can be delivered either pre- or postoperatively. Preoperative RT offers the possibility of shrinking the tumor to allow for a less extensive resection; postoperative RT results in less wound complications. The EBRT dose is usually 50 to 60 Gy delivered in 2 Gy fractions. Resection of advanced stage lesions may require total rhinectomy. A prosthesis is usually created to cover the defect, as total nasal reconstruction is cosmetically unacceptable. Little has been published about the use of chemotherapy in the treatment of nasal vestibule cancers. Management of the neck — Since the risk of cervical metastasis is low, elective nodal treatment (either radiation or neck dissection) should be considered only for patients with T4 cancers, particularly those that are poorly differentiated and/or recurrent. Patients who present with lymph node-positive disease should be treated with radiation to the involved neck and/or neck dissection. NASAL CAVITY — Tumors arising in the nasal cavity, posterior to the limen nasi, have a natural history similar to tumors of the paranasal sinuses and are treated similarly. Histology — Cancers with a wide variety of histologies arise in the nasal cavity; these are similar to those that occur in the paranasal sinuses. Minor salivary gland tumors account for 30 percent of neoplasms in the nasal cavity. Adenocarcinoma is the most common histology, followed by adenoid cystic, benign mixed, and mucoepidermoid carcinoma Acinic cell carcinoma is rare in the nasal cavity and paranasal sinuses. Patients with tumors of the nasal cavity usually present with a chronic history of sinus congestion and recurrent nasal obstruction. Many patients complain of nasal discharge and intermittent epistaxis. These symptoms can mimic those of chronic sinusitis or nasal polyps and may delay the diagnosis of cancer. 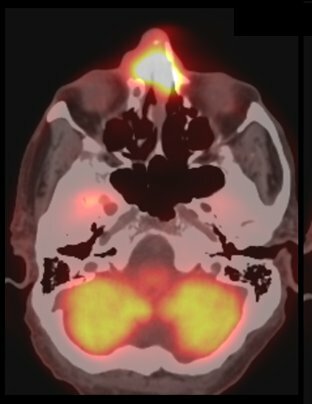 However, since chronic sinusitis is most often associated with bilateral symptoms, unilateral symptoms should be used as an indication for further evaluation, such as nasal endoscopy and/or imaging. The symptoms from more advanced lesions depend on the site of tumor spread: widening of the bridge of the nose from lesions invading the olfactory region, frontal headaches from extension through the cribriform plate or into the ethmoid sinus, and proptosis, diplopia, or a palpable orbital mass from invasion of the medial orbit. Treatment — Both early and moderately advanced tumors of the nasal cavity are treated with a combination of surgical resection and postoperative radiation. Very advanced (unresectable tumors) are treated with RT with or without concurrent chemotherapy. No randomized studies have evaluated treatment options for patients with carcinoma of the nasal cavity. Most retrospective studies combine nasal cavity tumors with paranasal sinus tumors, making it difficult to make conclusions that are specific to nasal cavity cancers. Advanced stage — The standard treatment for advanced stage tumors is surgery followed by postoperative RT. Although preoperative RT has been used to minimize tumor bulk and limit the extent of resection, we favor postoperative RT to minimize the risk of wound complications. Very advanced (unresectable) tumors are treated with definitive RT. Based upon experience with analogous tumors of the sinus and other mucosal sites, chemotherapy, administered as induction or concurrently with RT, is used by some for unresectable and more extensive lesions, but there is little supporting data. Management of the neck — Elective treatment of the N0 neck is controversial. Reported rates of nodal recurrence when the neck is not electively treated vary from 0 to 19 percent Some believe that there is no benefit to electively treating the N0 neck . Others recommend elective nodal treatment, either neck dissection or radiation, for patients with advanced-stage disease and/or poor prognostic factors. We suggest elective irradiation of the N0 neck in patients with T3 and T4 disease, tumor extension to areas rich in lymphatics (ie, the nasopharynx), and all esthesioneuroblastoma and sinonasal undifferentiated carcinomas (SNUC). Patients who present with lymph node-positive disease should be treated with neck dissection and postoperative radiation. POSTTREATMENT SURVEILLANCE — Regular posttreatment follow-up has become an essential part of the care of patients after potentially curative treatment of head and neck cancer (HNC). It is particularly important for nasal vestibule cancers because recurrences can often be salvaged successfully. Patients should be educated about possible signs and symptoms of tumor recurrence, including hoarseness, pain, dysphagia, bleeding, and enlarged lymph nodes. In general, the intensity of follow-up is greatest in the first two to four years, since approximately 80 to 90 percent of all recurrences after curative intent treatment will occur within this timeframe. Continued follow-up beyond five years is generally suggested since the risk of recurrence remains elevated beyond the first five years, especially for cancers of the hypopharynx, larynx, nasopharynx, and salivary glands and for second primary malignancies. Because of the higher risk of recurrence and second primary malignancy in those who continue tobacco use, many schedule more frequent surveillance visits for these patients and continue for longer duration (ie, beyond five years). Posttreatment surveillance of head and neck cancer, including screening for treatment-related complications, is reviewed separately. Nasal vestibule — Carcinomas of the nasal vestibule are essentially skin cancers and have a good prognosis. We suggest that patients with early-stage (T1-T3) tumors receive primary treatment with RT alone. Surgical excision is an option if the lesion can be removed with a good functional and cosmetic result. 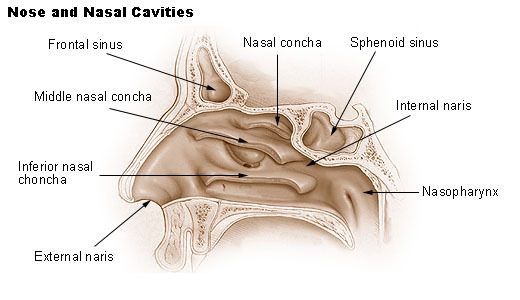 Nasal cavity — Tumors arising in the nasal cavity have a natural history similar to tumors of the paranasal sinuses. A wide variety of tumor histologies occur in the nasal cavity, with squamous cell carcinoma and adenocarcinoma predominating. Patients with early and advanced stage disease are treated with the combination of surgical resection and adjuvant RT. We suggest postoperative RT, which minimizes wound complications, rather than preoperative RT. For T1N0 tumors, surgery alone is a reasonable treatment option. For very advanced tumors, we suggest combined modality therapy with chemotherapy added to radiation, as induction and/or concurrent chemoradiation.